As everyone surely knows by now, the French are in full retreat all across town. Just the other week, word leaked out that Alain Ducasse would be closing his pricey, aggressively baroque restaurant in the Essex House and reopening it, in somewhat more modest form, elsewhere. In the past few years, the city’s other grand Francophile establishments have gone dark one by one. The few that remain limp along as remade brasseries, or survive on the goodwill of Upper East Side bon vivants or elderly couples in town from, Cleveland, say, or Palm Beach. Into this perilous environment steps Joël Robuchon, whose latest restaurant, L’Atelier de Joël Robuchon, opened late this summer in the Four Seasons hotel. Robuchon, who actually left professional cooking for a brief time in the nineties, is arguably as grand a French chef as Monsieur Ducasse. But after his time of contemplation, he returned to the restaurant business with a radical new formula borrowed from Japan. And he comes to New York with something most French chefs never had: a time-tested franchise and his own formidable international brand. This is the fourth L’Atelier Robuchon outlet to open around the globe, the other three being in Paris, Tokyo, and Las Vegas (Robuchon has a fifth restaurant in London). All of the L’Atelier establishments (the name means “workshop”) are built around the traditional Japanese concepts of small-plate, omakase (chef’s choice) tastings and dining at the bar, and Robuchon shuttles among them, adjusting recipes and menus, like a kind of jet-setting haute cuisine Ray Kroc. 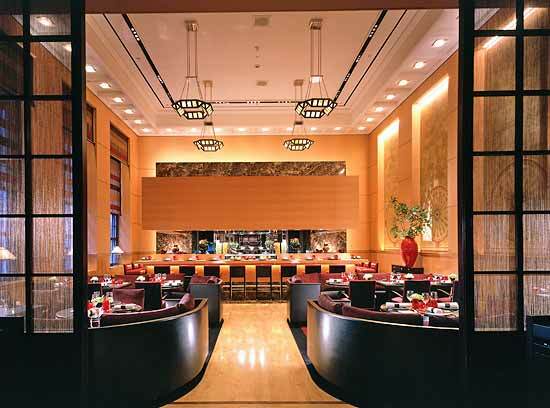 There are contradictions inherent in Robuchon’s formula, however, and many of them are on display at the Four Seasons. The small room abuts the hotel’s crowded bar area, which, in the evenings, tends to obliterate any sense of Zen-like serenity. There’s nothing particularly serene about the space, either, which is decorated with peach-colored walls, lots of blond wood, and the odd palm frond. The original L’Atelier, in Paris, only has dining counters, but here there are also tables, and the difference between sitting at them and at the more intimate twenty-seat bar can be extreme. My first meal at L’Atelier was at one of the tables. There were four of us, and we had to raise our voices to be heard over the cocktail din from the next room. These tables are low-slung and packed together, so you get the unfortunate sensation, as the meal progresses, of crouching and looking up. Then there’s the abstruse menu, which contains 22 small “tasting portion” dishes, some of which are duplicated in slightly larger form, among seventeen additional standard-size appetizers and entrées. Sensing confusion, our waiter (dressed, as waiters appear to be throughout the L’Atelier empire, in a kind of dark puppeteer’s costume with a Nehru vest) pointed out the $160 tasting menu, which confused us even more. We eventually ordered à la carte, and when the food arrived, it came in a disorderly jumble. A portion of sea urchin intricately fixed in lobster gelée followed foie gras–stuffed quail, which followed large slices of insanely fatty Kobe beef. It was all quite good, but the way it was served left the impression that Robuchon couldn’t decide whether we should experience his cooking as a random collection of tastes or as a standard sit-down dinner. At the dining bar, however, Robuchon’s philosophy begins to make sense. The chef’s intensely flavored recipes invariably work better in the kind of smaller portions one normally orders at a bar; even his pointy, deliciously crunchy baguettes are tiny enough to fit in your pocket. During my first meal at the bar, I sampled a glass of smooth, lightly tart gazpacho, which seemed to have been beamed in from one of the more sophisticated culinary precincts of Barcelona. After that came a pair of frog’s-leg croquettes (bite-size, and neatly flavored with parsley and garlic), squares of bluefin tuna touched with a sun-dried tomato mash, and an impressively sweet langoustine, wrapped with a lone basil leaf, and tucked inside a lightly fried crust. There were also rows of Kumamoto oysters barely cooked in salty butter; slices of the finest foie gras terrine squeezed, sushi style, between layers of faintly caramelized Japanese eel; and, for a whopping $88, a single egg (hard on the outside, poached within) set in a spidery net of feuille de brick pastry and served in a pool of crème fraîche, with a giant spoonful of osetra caviar on top. This is haute cuisine of the most extreme, stylized kind. But at the bar, the pretentious (and, of course, French) service rituals are stripped away, leaving the focus solely on the food. At least that was my beneficent view. My wife objected to the bar servers’ hovering over us, and to their tortured, bent-over attempts to fill our water glasses every three minutes or so. But there was no debating the quality of Robuchon’s sweetbreads (roasted and wrapped around a sprig of fresh laurel), even if the chef had already left town (to date, he’s been in New York for just one week in August and one week in September) by the time we tasted them. Ditto the expertly cooked rack of lamb, the hanger steak (absurdly tender, with a light blanket of sautéed shallots and garlic), “Les Ravioles” (tiny moon-shaped pasta stuffed with foie gras and floating, with more crème fraîche, in an herbal chicken broth), and the gently seared cod, which comes to the table shrouded in a wontonlike skin delicately stenciled with the imprint of a single parsley leaf. The effect of this kind of high-wire cooking is somewhat diluted by the restaurant’s setting. I’m sure there are many good (and lucrative) reasons for Robuchon to locate his newest gourmet outlet in the happy-hour area of the Four Seasons hotel. But providing his patrons with the sense of specialness that comes with dining in a great restaurant doesn’t seem to be one of them. A visit to the restroom requires a circuitous trip past the hotel newsstand, and if you’re early for your table, you must elbow through a rabble of martini-addled bankers to wait at the bar. But these hassles don’t completely diminish the pleasures of dessert creations like “Le Sucre,” which is a giant pearl of spun sugar containing a deposit of fluffy, egglike white and yellow cream. Crack the shell, and watch it all melt together with a variety of esoterically flavored jellies (blackberries, violets, litchis) and creams. It’s the most ornate, overdone, and resolutely French dish on the menu at L’Atelier, and after a bite, or two, it might even make you a little wistful for the vanishing pleasures of the ancien régime. Prices: Small plates, $12 to $24. Appetizers, $15 to $88; entrées, $33 to $49. Note: The place to sit is at the bar. The time to visit is at lunch, when the crowds thin and the room fills with light. Hours: Lunch, daily, 11:30 a.m. to 2 p.m. Dinner, daily, 6 to 11 p.m.
Scratchpad: Four stars for Robuchon’s superior cooking (even though he’s rarely there). Minus one star for the room and setting.